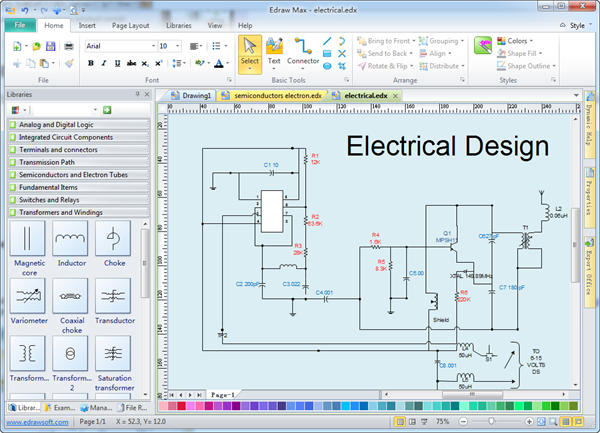 Powerful but easy-to-use Electrical Design software help create professional-looking electrical diagrams based on standard electrical symbols. 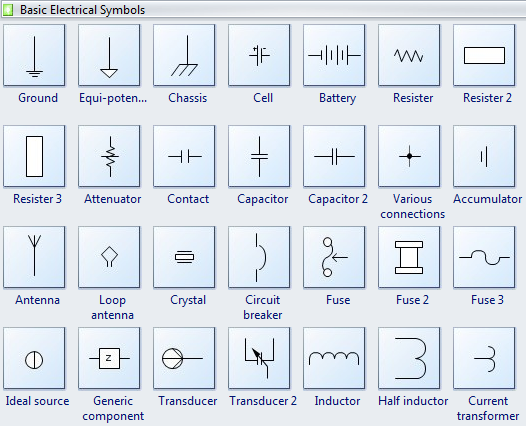 Use powerful and easy-to-use Electrical Design software to help you create professional-looking electrical diagrams based on standard electrical symbols. Edraw electrical design software will assist you in drawing your electrical diagrams with minimal effort and makes it pretty easy for beginners. Built-in electrical symbols and smart connectors present your electrical drawings, electrical schematic, wiring diagrams and blueprints in electrical standards intelligently. Discover why Edraw Software is a smart choice to design electrical. Try Edraw Max FREE. Electrical diagrams are created extremely fast owe to the unique Model Based drag'n draw functions. No other diagram software can match this feature! Save tons of time using our program as your electrical design software. It possesses more than six thousand symbols. All symbols and objects are designed as intelligent. They think for themselves so they know what the proper behavior is at different occasions. They can even tell you how to apply them when you move the cursor over them. All you have to do is imagine and Edraw do the rest hard work for you. Everything is aligned and lay out perfectly, automatically. Output is vector results which can be expanded or zoomed down as you please, without losing clarity. Got a question? Feel free to email us. Our awesome experts are always standing by ready to help, for free. The following images show some basic electrical symbols such as ground, equi-potentiality, chassis, cell, battery, resister, attenuator, contact, capacitor, accumulator, crystal, fuse, source, transducer, inductor, etc. 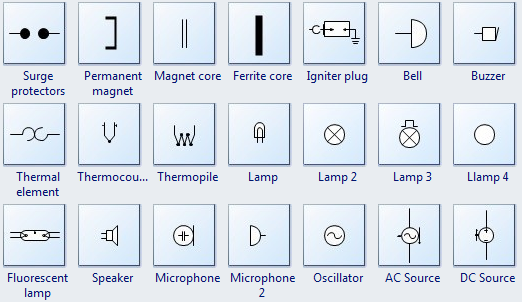 The following images display some extended electrical symbols such as surge protectors, permanent magnet, magnet core, ferrite core, ignite plug, bell, buzzer, thermal element, lamp, speaker, microphone, oscillator, AC source, DC source, etc. 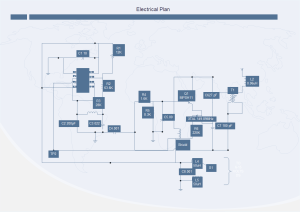 A electical plan template is ready to use in vector format for your own designs.